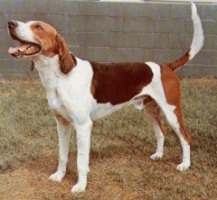 My earliest Harrier relatives were the result of a cross between the Beagle and the St. Hubert Hound. Harriers became very scarce in the first part of the 1900�s, though, so in order to preserve us, breeders introduced Foxhound lines. I still have a strong natural hunting instinct, so I prefer to live with outdoor types in the country or in the suburbs instead of in the city. When fully grown, I am between 19 and 22 inches tall (48.3 to 55.9 centimeters) and I weigh between 48 and 60 pounds (21.6 to 27 kilograms). We have no Harrier Breeders listed at this time. Click here to place your Harrier Ad!